Kershaw Doors Ltd who are a very well established timber door supplier since 1999 have extended their contemporary styled Mega Oak door range to include a high quality external door version which includes both a solid and glazed option. This new addition to the range was developed during 2012 released at the end of that year and is now on a special release price for 2013. The Mega Oak exterior door specification surpasses many of it’s counterparts in the industry yet is offered at a very reasonable price of £281.69 for the solid version and £364.44 for the glazed option. Both doors are available in 2 popular sizes of 762mm x 1981mm and 838mm x 1981mm. The Mega is constructed using a laminated Maple and Beech core, has 18mm Solid Oak edges and a superior 3mm thick Oak facing. The Mega 3V glazed option has the same specification as the solid door with the addition of 3 x 24mm Frosted glass vision panel (Low E Argon) units. The doors are supplied boxed and ready to finish. In addition to the standard sized Oak Mega, Kershaws Doors have extended the range further to include both a solid and glazed side panel, offering versatility when creating grand entrance sets to your chosen design function. Leading flooring manufacturer Flowcrete North America Inc is introducing at World of Concrete 2013 the world-renowned Deckshield parking protection systems into the Americas market. Flowcrete Deckshield has built-up an extensive track record protecting outdoor parking structures within Europe, the Middle East and Asia – and is now being manufactured by Flowcrete North America for projects across the Americas. The system – available in a choice of polyurethane and rapid-curing MMA variants – is being introduced on the back of increased demand for a product capable of delivering both a protective and aesthetic function in modern parking environments. As the growth in construction of commercial structures continues, more and more cars visit airports, retail malls, hotels, office blocks and public buildings. By utilizing the very best of protective coating systems on the internal structure of the parking area, visual appearance can be enhanced, light reflectivity improved, traffic movement regulated and ongoing structural maintenance can be kept to an absolute minimum. As well as launching Deckshield at the Las Vegas event, Flowcrete North America Inc is also promoting products including Flowfresh FCUV a four-component, semi gloss UV light stable polyurethane concrete coating. Designed to be used as a UV stable sealer or as a lock coat for quartz broadcast floors with Flowcrete’s hygienic Flowfresh flooring systems, FCUV includes the Polygiene® antimicrobial system, offering exceptional chemical resistance. 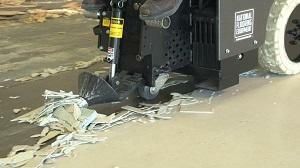 Flowseal Ultra, a fast curing and UV stable polyurea coating, is also being featured at World of Concrete. A two-component, chemical resistant system, it is designed to be used as a fast curing UV stable sealer, or a receiving coat for flakes and quartz broadcast systems. Flowcrete will also be talking to visitors to their stand at World of Concrete about the company’s advantage within the marketplace in the manufacture of sustainable flooring. In line with its sustainable corporate philosophy, Flowcrete North America has restricted the use of toxic components in our flooring products. This includes manufacturing products that are free of components including Phthalate, Nonyl Phenol and Solvents. Flowcrete North America Inc is on World of Concrete’s Booth S11339, from February 5th to the 8th, 2013. The construction and maintenance division of Howden UK mark a record five years since their last Lost Time Incident and their fifth 5 star award from the British Safety Council. While the year may be nearly over, 2012 has been a highly successful one for the construction and maintenance division of Howden UK, which marked five years since their last Lost Time Incident (LTI). 2012 also marks the fifth consecutive year that Howden UK construction and maintenance division has been awarded the British Safety Council’s 5 Star Award for Health and Safety Management and working to best practise. Howden UK’s recent award from the British Safety Council, which was awarded following a three day audit carried out at their Kingswinford office and at West Burton Power Station, also marks another cause for celebration for the company. This is because this 5 star award, which is highly sought after in the industry, and which they were first awarded in September 2007, also gives them the opportunity to finally apply for the council’s most prestigious award. Maybe you are a home user getting ready to tackle a Do It Yourself (DIY) task or maybe you are a professional taking on a new job, but in either case you probably recognise the importance of having the right tools for the job. Fix 8 also recognise that whilst a bad workman always blames his tools, having the right power tools to hand will help get things off to a much better start. Indeed Fix 8 pride themselves on their ability to supply both the amateur DIY person and the professional tradesman with high quality power tools at prices to suit all budgets. As an example you may just need a lightweight cordless screwdriver for very occasional use around the house, in which case Fix 8 would recommend a small 3.6v model. However, they also supply a wide range of heavy duty cordless screwdrivers and drills in a wide range of voltages from 10.8V to 36V, including the common sizes of 7.2,9.6 and 14.4V, as well as truly industrious high power 24 and 36V models. Fix 8 advise that the latter are ideal for professionals and are ideal for continual heavy use including drilling in to concrete. 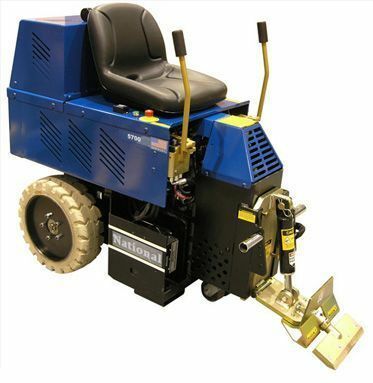 When it comes to working with wood then they supply a complete range of electric planers, routers and sanders to cover all of your woodworking needs. Indeed they specialize in the Makita range of sanders, which have been chosen by Fix 8 for their ease of use, durability and value for money. They offer a full range of Makita sanders from high-powered angle sanders, orbital sanders, belt sanders, filing sanders, palm sanders through to multi-purpose sanders. Fix 8 also have a wide range of power tools designed for working with harder materials such as concrete, ranging from heavy duty hammer drills capable of using extra long drill bits through to stone cutters. All of Fix 8’s power tool range can be found on their website, where pictures, and full descriptions of all of their power tools can be easily accessed and ordered online. Best of all if you spend more than £50, next day delivery is free, and as Fix 8 recognises that your time is money, you can even have your new power tools delivered directly to the site you are working on, saving you time by letting you get on with work and not having to wait at home for a delivery. On their new website Fix 8 also offer a wide range of accessories for all of their power tools, from spares batteries to dust extraction units and Bosch jigsaw blades, making them a one stop shop when it comes to power tools. Once you have checked out their latest range of power tools online you may want to order some of the extensive range of fixings and fasteners that they sell, in order to complete your job, all of which are also available with next day delivery. Fix 8 also offer a comprehensive range of support online as well as having highly knowledgeable staff that can handle all of your telephone enquiries. Installation of a 24-foot noise barrier utilizing Acoustifence outdoor sound abatement material at the new Sheboygan Festival Foods store is complete, ending complaints from nearby residents over extreme levels of noise leaking from the store’s industrial refrigeration chillers into the community. Folks in Sheboygen were celebrating when the popular Wisconsin-based Festival Foods grocery chain opened the 70,000 square foot mega store here on September 16, 2011. Less than two weeks later, the community’s warm welcome had grown icy as neighbors began to complain about noise from the store’s industrial refrigeration chiller that was so loud, it violated the city’s noise ordinance. Festival Foods enlisted the help of Acoustical Engineer Eric Wolfram of Milwaukee-based Scott R. Riedel & Associates, LTD, who consulted with Acoustiblok’s Jay Boland to choose Acoustifence noise barrier material, a product of Acoustiblok, Inc. of Tampa Florida, to bring the decibel level down below the legal threshold and restore peace and quiet to the neighboring community. When Wolfram first investigated the site in September, decibel readings ranged between 78.4 and 90.7, loud enough to be a risk for noise-related health problems to nearby residents and workers, had they been subjected to the noise over time. The Sheboygan Department of City Development demanded the level be reduced by at least five decibels, Wolfram said. “The existing refrigeration pump and motor systems produce extreme noise levels,” Wolfram said. “This noise reverberates within the sheet-metal paneled enclosure interior and escapes through several different exhaust and ventilation openings. Working with sound consultants from Acoustiblok, Inc., Wolfram designed a two-step solution, creating a barrier with Acoustifence noise deadening material to block noise around the massive system, and incorporating another Acoustiblok product, QuietFiber, to help reduce sound from reflecting off of the taller adjacent building behind the chillers. Minimal structural changes were required, as the ⅛- inch Acoustifence was easily attached to an existing chain link fence and the outdoor-rated QuietFiber with a perforated metal cover was capconed to the building. The results were better than Wolfram had hoped, with decibel levels reduced to 57.3 the moment the barrier was in place – well below the City’s legal threshold, and more than 20 decibels lower than before the Acoustiblok products were installed. Neighbors are no longer bombarded with the irritating chiller noise, now replaced with the ordinary ambient sounds that existed before. “Sounds from local traffic and roadways exceeded that of the compressor equipment after installation of the Acoustifence and QuietFiber products,” Wolfram said. Lahnie Johnson, founder and president of Acoustiblok, Inc., applauded Festival Foods’ quick action in addressing the noise complaints right away, stating that the product combination was the perfect solution for this particular type of noise challenge. For more information on industrial noise solutions, visit the Acoustiblok website, Email sales@acoustiblok.com, or call 813-980-1400. Acoustiblok noise abatement material was installed in the nearly completed Artist Workshop Studios recording facility, an in-the-box (ITB) studio designed and built by Artist Workshop Studios owner Tom Donofrio. Acoustiblok was chosen to provide a sound barrier for the small, 12 foot x 12 foot basement studio that could drop decibels levels within the space and provide a neutral acoustical environment for recording. Donofrio, an electrical engineer, and musician who has built recording studios in the past using different sound deadening materials, chose Acoustiblok for his newest project after consulting with Marilyn Myers of Acoustiblok, Inc., because of its sound damping and noise blocking qualities, as well as its thin, flexible structure that adds no volume to walls within the studio space. Attached to the studs before drywall is hung, Acoustiblok performs without the need to add layers of rigid drywall or modified drywall, a method Donofrio used in the past with mixed results and significant floor space reduction. “I was looking for a product that would lower the decibels in the studio without taking up any additional space,” Donofrio said. “I was able to achieve the neutral acoustics desired in the space, which makes me extremely happy. Donofrio and a friend were able to hang the 3mm Acoustiblok on the newly framed stud walls within the studio space, including cutouts around a window and electric sockets, and seal the seams according to installation recommendations, all in less than four hours. The Artist Workshop Studios recording space was built for Donofrio to indulge his own talents as an acoustical guitarist and vocalist, and to be made available to artists on a budget who need an affordable studio with high quality production equipment and the expertise of a seasoned technician to record a song or album. “Acoustiblok is a perfect choice for establishing sound quality within a sound recording studio like this one,” said Lahnie Johnson, president and founder of Acoustiblok, Inc. Installation of 18,000 square feet of non-fiberlass Quiet Fiber® noise abatement material has been completed in the massive generator room of the newly constructed, 750,000 square foot Galleria 360 mall in Santo Domingo. Quiet Fiber, a product of Acoustiblok, Inc. in Tampa, Florida, was installed on the ceiling and walls of the mall’s generator and substation rooms. These rooms house the industrial emergency generators necessary to keep power running in this coastal area of the Caribbean, plagued by frequent power outages. The Galleria 360’s industrial generators, installed by Santa Domingo-based Edelca, are a staple in this island republic. Edelca owner Carlos Montos, Edelca consulted with Jay Boland of Acoustiblok, Inc., and used Quiet Fiber on the project after achieving excellent results with Quiet Fiber on a similar project at the La Sirna Superstore in the eastern coastal town of Higuey, Dominican Republic. “Even though Quiet Fiber is not the least expensive product on the market, I keep coming back to it because the results beat all the competitors’ noise deadening products with double the noise insulating qualities,” Montos said. “The customer on this job wanted to install a double layer of a different product but I convinced him to try the Quiet Fiber. Montos says noise from these industrial generators on which the island has become dependent in order to maintain consistent power is a major problem plaguing businesses and residential property owners when the generators are running. Not only is generator noise bad for business, but its constant drone can cause permanent hearing loss. Another important consideration in the selection of soundproofing material is its fire resistance. Recently in Santo Domingo a serious fire started in a generator room, and the existing foam sound proofing material was a prime contributor. The fire caused Montos to search for a new fireproof solution. Quiet Fiber is fire resistant even at 2,000 degrees. Montos and his crew were able to easily cut the Quiet Fiber to fit around electric conduits, and secured the material to the walls and ceiling with standard insulation stick pins. The sound deadening qualities of Quiet Fiber will help to protect the mall’s employees, and streams of tourists and local residents from the high volume industrial noise caused by the generators when they are operating. Lahnie Johnson, president and founder of Acoustiblok, Inc., says that the application of Quiet Fiber in the Galleria 360 generator and substation rooms was exactly what was needed for addressing the high decibel, reverberant sound emanating from the concrete walls. Eighteen months after adopting Hubspot’s all-in-one marketing platform, Tampa, Florida-based Acoustiblok has increased website traffic by 210 percent, increased organic search leads by 307 percent, and increased customer transactions by 40 percent, contributing to Acoustiblok’s record sales increases in 2011. Hubspot named Acoustiblok a “Best Practices” customer based on its application of Hubspot marketing tools for website management, blogging, search engine optimization (SEO), lead management, marketing analytics, social media monitoring, and website analysis. “Being recognized by an industry leader as a “best practices” customer is a real accomplishment, and one we’ve worked hard to achieve,” said Liz Ernst, director of public relations for Acoustiblok, Inc. “We have a small marketing and PR team, and we had been trying different approaches to increasing traffic and drawing attention to our Acoustiblok soundproofing product line, and our Thermablok aerogel insulating strips. Acoustiblok President and Founder Lahnie Johnson says that Hubspot provided the traffic building tools he had been looking for in order to achieve the huge growth goals the company had set for itself. HubSpot, Inc., based in Cambridge, Massachusetts, provides an all-in-one marketing software platform used by more than 5000 companies in 34 countries. HubSpot is also the developer of WebsiteGrader.com, a website analysis tool with more than 3 million users. HubSpot, Inc. was founded in 2006. Coca-Cola has completed installation of Acoustifence® noise barrier fencing along the west perimeter of its Bay City plant, bringing to an abrupt halt those noise issues that had been plaguing neighbors in the surrounding community and attracting local news organizations as the outcry from area residents grew. Architect Jack Zelazny of Dearborn, Michigan, acting as a consultant to Coca Cola’s contractor Kirco Manix, chose Acoustifence noise barrier fencing for the core of the 300 foot wide noise barrier project designed to alleviate noise from idling delivery trucks at the plant that had been plaguing neighbors in the South End Community. Zelazny said the initial plan was to construct a 30 foot acoustical metal fence along the perimeter roadway to address the problem, but he nixed the idea in favor of something significantly less expensive and more aesthetically pleasing to the community’s residents. After researching sound barrier fencing options, he found Acoustifence, a product of Acoustiblok, Inc. in Tampa Florida, and discussed his options with acoustical consultant Paul Getts of Acoustiblok. After conferring with Getts, Zelazny moved ahead with construction of a grass covered, 300 foot wide berm that incorporated a nine foot high Acoustifence barrier and landscaping for an attractive roadside aesthetic. The project was completed in the final weeks of December, and both company officials and neighbors rang in the New Year with their new found peace and quiet. “The Acoustifence went up flawlessly, and it’s not unpleasant to look at,” Zelazny said. “When we covered it with the dark green acoustical fabric covering it looked natural and organic, as we had hoped. Zelazny said the plant noise measured at 89 decibels before installation of the Acoustifence began, and registered at 68 decibels immediately after the Acoustifence went up. His hope was to lower the noise by 20 decibels, a figure that was exceeded at the plant, and more than doubled at the neighboring residence as soon as the Acoustifence was put in place. A reading taken at the adjacent residential property registered in the low to mid 40 decibel range. “It exceeded my expectations, I think it exceeded everyone’s expectations,” he said.“The people at Coca Cola are happy with it, and most importantly the neighbors in the surrounding community are happy with it. Lahnie Johnson, president and founder of Acoustiblok, Inc., said that the application of Acoustifence in the bottling plant’s noise barrier berm was the soft drink company’s best alternative for significantly reducing noise, and respecting the surrounding community’s call for peace and quiet. 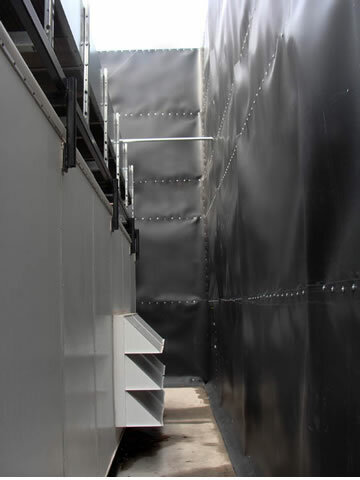 Originally developed as a noise barrier on loud offshore oil rigs, Acoustifence is a simple and economical first-step noise abatement solution for both residential and commercial usage. A 1/8-inch (3mm) thick unique sound deadening material measuring 6 feet (1.82 meters) high by 30 feet (9.14 meters) long with black anodized brass eyelets along the top and bottom edge for easy attachment to any existing fence or structure. Heavy-duty nylon ties are included with each roll. Easily installed or removed in less than one hour, impervious to mold, mildew, and UV, Acoustifence is virtually indestructible. The soundproofing material in Acoustifence is a proprietary formula of the Acoustiblok Corporation, developed and refined over a 10-year period. Gabriel Carini, a San Diego heating air expert, marked his eighth year in business with a new, larger office for his company, Carini Heating and Air Conditioning. “As our business quickly grew, we realized we’d outgrown our previous location and needed to increase our square footage in order to better serve our customers,” said Carini, an expert in all brands of heaters and whole house air conditioners. The new location, a house turned office, has a much larger shop area. Carini said the primary goal of the company has always been to provide excellence in allair conditioning and heating service, repair and installation. He specializes in retrofitting the HVAC system in older homes in historic neighborhoods, such as Kensington, North Park, Mission Hills, South Park, Hillcrest and Bankers Hill. Carini and his team of technicians also work with property managers in large developments and rental properties, as well as contractors in new construction, for service and installation of heating and air conditioning units. Carini Heating and Air Conditioning has been an Accredited Business of the Better Business Bureau since 2008, which means that the BBB has determined that they meet their accreditation standards. Carini has maintained an A rating, on a scale from A+ to F. The rating standards are based on 16 factors, including complaint history, time in business, background information, commitment to BBB standards and no known issues with licensing, government or advertising. For more information about the services available from Carini Air Conditioning And Heating, please call the office at (619) 843-0997 or visit this page:http://www.cariniair.com/Commercial.html. It is believed that Calacatta Gold marble mosaics tiles polished and honed have always been the choice of kings in the ancient world for it strength and beauty. However the cost of this product and limited availability has put it out of reach and budget for most homeowners until now. The Builder Depot has launched a new collection of Calacatta Gold marble subway tiles, floor tiles, mosaics and trims for 2011 creating affordability and availability for homeowners, contractors and developers of a much sought after Calacatta gold product.